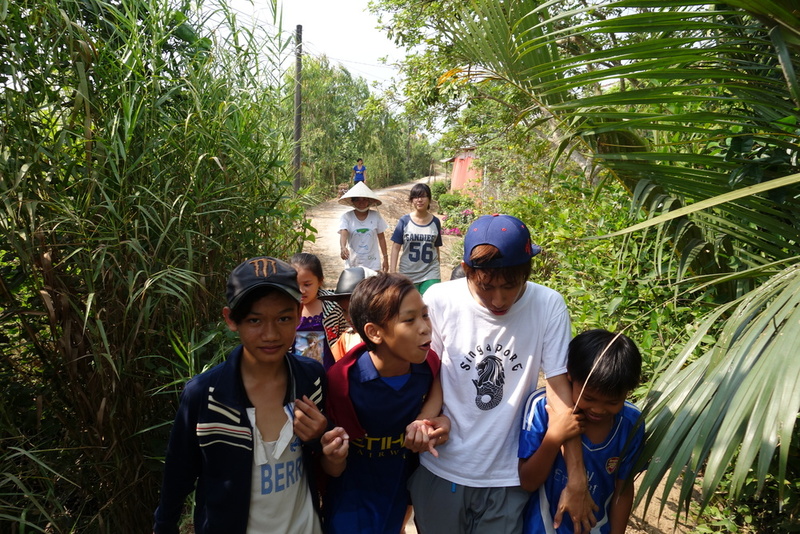 Annually, STEP Forward Exchange hold Community Service Camp in Vietnam with the aims to foster youth responsibilities in social activities as well as to encourage and improve cultural awareness and understanding between local and international communities. Moreover, through experiential learning, we encourage people of all backgrounds to improve self-awareness,social understanding, learn new skills and explore their potentials. STEP Forward works to improve the livelihood of impoverished families and communities in rural areas of the Mekong Delta region in Vietnam. This is achieved through the provision or reparation of housing and schools, micro-finance loans and scholarship programs. The Mekong Delta is a region in southern Vietnam. Despite strong agriculture and aquaculture industries, industrial infrastructure and foreign investment is relatively small across the region. As a result, the area has remained largely undeveloped economically. We offer volunteering opportunities in Vinh Long Province. We also call for donations and fundraising from the public, all funds go to projects supporting disadvantaged families in rural Vietnam. Join our team of fundraisers and help transform communities. We need your support! Where I met strangers who would become familiar. Overcoming the language barriers, cultural differences, we who come from different places with distinctive personality worked together to make the miracle even small. 10 days in the camp, we shared both joy and sorrow, there are smiles as well as tears. Despite the short time of the camp, those precious memories will always remain in my heart. I hope STEP will organize more programs to give young people the opportunity to learn and develop, experience new things and help the surrounding community. Looking forward to the chance of participating in future STEP activities. STEP is a well-organized group with interesting programs and outstanding facilitators. The workcamp they organize every year is a very great platform to meet bunch of enthusiastic and self-driven volunteers from different countries to carry out volunteering activities especially in rural area of Vietnam besides getting to understand more about each other's cultures and background. I've spent my last summer here and it was definitely all worthwhile! STEP helped me grow better as a person and raised my awareness about giving back to society and helping the less fortunate. I enjoyed every moment of cultural exchange, social volunteer and expanding my network internationally while having fun with the team. Would recommend 100/10. My volunteering time at STEP has been incredible. It continuously taught me something new about people, about cooperation, about compassion, and about myself. I decided to participate in STEP because I love meeting different people from different backgrounds and cultures while volunteering. I also like having my comfort zone stretched and expanded. STEP has not only fulfilled my expectations but also give me many chances to create new “weak tie” connections that lead to career opportunities. First joining as a volunteer, not long after that I became a team leader, and in the near future I will be cordinating an International Workcamp! And now I'm really looking forward to working with you and the next workcamp! It helps us understand Vietnam culture through interacting with local people and organizations. The helpers are great and helpful in my last workcamp in 2018. I wish to cooperate with this organizations again in the near future. They say all caterpillars have to go through a time of hardness before they come butterflies and that was given to me through my trip with Step and other friends. It trues that friends wont last forever but memories do and thank you for giving me best memories in my summer 2018.. If I were given a miracle, I would choose to turn back the 10 days of STEP's camp. On that 10 days, though we experienced such extreme living conditions, bright smiles still existed on our faces since each of us knew we were making impact on our community. Cultural differences, language barriers, diverse personalities coundnt stop us from being friends and sharing love. Mannual work and teaching sessions taught us happiness and positiveness should come from inside. We met one-of-a-kind locals and kids on the camp site. Thus, we learnt and grew up. I hope STEP will grow more and more to reach your aims of strengthening young generations and making changes for our society.